History of the 2-bore rifle is somewhat enigmatic. Certainly there were a number of large bore-caliber punt guns produced in the mid nineteenth century for use in waterfowling. There is even record of adaptation of quasi two bore rifles for hunting elephant and other large game in 19th century <?xml:namespace prefix = st1 ns = "urn:schemas-microsoft-com:office:smarttags" />Africa. These rifles were mostly smoothbore muzzle loaders of varied bore diameter and none are known to have possessed a true 1.325"+ bore or groove. Bore caliber rifles utilizing modern fixed ammunition were eventually produced in limited numbers and did find their way to various hunting grounds. These seem to have peaked in size at 4-bore and a generally recognized standard of slightly less than the official 1.052". 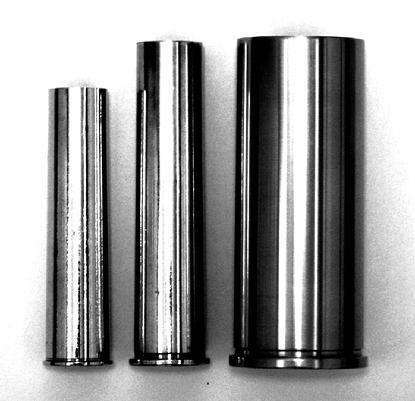 A few 2-bore rifles have been produced in effect by lengthening existing 4-bore cases and increasing projectile weight to 3500 grains with corresponding charge weight.